"The painted metal and wood sculptures of Marc Berlet display not only unusual technical competence but also, what is far rarer and more admirable, a forceful capacity for creating aesthetic pleasure. This sculptor is plainly at ease with his materials and consequently well able to bring into being a three dimensional works of art which does no violence to a viewer’s appreciative faculties Berlet is also at ease and fluently conversant with the artistic language of the 20th century. He has grasped what it has to say and has burned to eloquent account the virility and the good cheer of fine craftsmanship are the outstanding characteristics of Berlet’s work. He is a diligent seeker of visual diversion and both by form and by color shows how handily it can be made tangible – I salute his style, his resolve, his humor, his versatility, his skill and his achievement – in a word, his art." "Thirty-five years ago, the late Abstract Expressionist Joan Mitchell brought to my attention the work of a young friend of hers, a sculptor named Marc Berlet. "Keep your eye on him", she advised me. Since Mitchell was never known to give her praise idly, I was not surprised to find that, through the years, the early promise she recognized has been richly fulfilled. Wether in wood, painted steel, aluminum or marble, whether large, small or medium sized, his work has been consistently distinguised by superb craftmanship, imagination and originality. In some of the sculpture, the influence of Alberto Giacometti is cleraly apparent but has always been felicitously assimilated, so that his work can never be dismissed as derivative. And his most recent pieces in aluminum manifest but do not imitate the elegance and power of another great modernist, Constantin Brancusi. 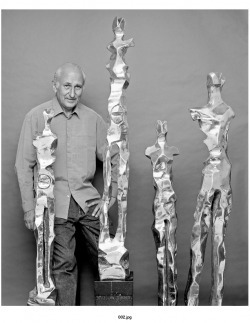 In every respect, Marc Berlet has come into his own as a sculptor."